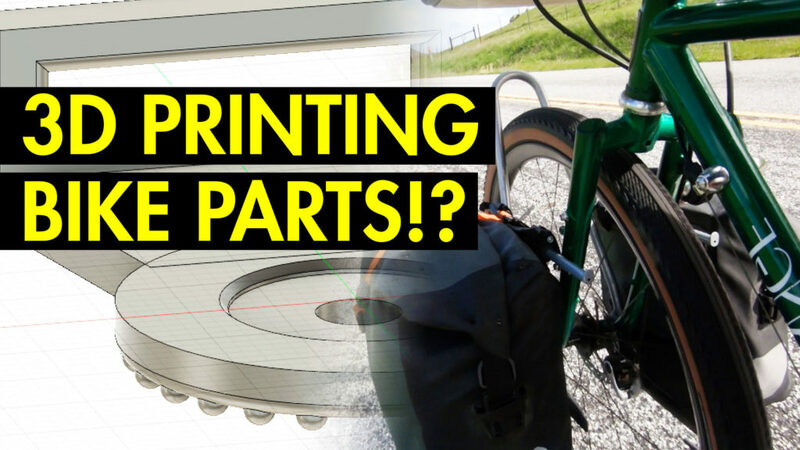 Home > Video > 3D Printing Bike Hacks? I recently discovered the magic of 3D printing and decided to try my hand at making some bike parts. One thing I wish my Ortlieb Gravel panniers were able to do, was to be converted to a bungee system. It seems counterintuitive to use “old” and unsophisticated technology like a bungee to “upgrade” panniers, but in certain instances, they work really well. In this first (of hopefully many) video about my journey into 3D printing, I fabricate a new part and use a pre-existing bungee system offered by Ortlieb to work with my Gravel Panniers. I’m commenting here since I don’t want to deal with YouTube’s commenting system. 1. It’s funny, I converted my pannier from a bungee to a hook style because I didn’t like the amount of sway I got with the bungee. I cannibalized the hook from another pannier (and mail ordered a replacement) and milled a new rail. Maybe it could have been 3D printed, but it was simple enough to mill out of plastic too. This was for the rear, so there wasn’t an interference issue. 2. It seems like you could make the strap guide with a bit of bent sheet metal and have it be much more durable. All you’d need to do is cut to shape with a hacksaw, cut the slot with a dremel tool, drill the bolt hole, then clamp it in a vise and hammer a fold into it. 3. Or if the problem is that there is too much going on right by your disc brake area, maybe flip the curved plastic rail upside down, so the hook wraps around the fork slightly higher up. It’ll sway a bit since the hook is closer to the upper rail, but still probably less than with a bungee. 4. All I’ve 3D printed for my bike is a bunch of brake hose clips. There are at least seven different models on Thingiverse, and still none fit well on my bike. I took the best fitting model and with my slicer program, decreased the Z-axis to make it thinner, and decreased another axis so the hose wasn’t so loose. Printed in PLA so it’s nominally biodegradable when one of the clips inevitably falls off when riding. There are definitely different and better ways to fab the part. I wanted to use it as an excuse to try 3D printing. Not to mention we live in a small apartment with no garage and tools like a vise or anything to bend/cut metal or plastic so it was actually cheaper (free) and faster to do it via 3D printing. I went down this rabbit hole a month ago and bought an Ender 3 (~$200). Pretty amazing how cheap these machines have gotten & what they can do – mine can do much better quality than your photos of the library prints here. It’s magic! I’m learning Fusion right now – trying to recreate a dynamo light mount. I just started experimenting with PETG material (plastic like a nalgene bottle) which is what I’m planning to use for bike parts.